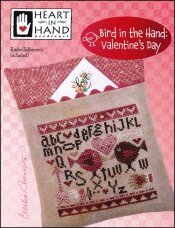 Bird In The Hand: Valentine's Day [H1141] - $8.50 : Yarn Tree, Your wholesale source for cross stitch supplies. Cross stitch pattern from Heart In Hand. Be my tweet heart? These two birds have fallin' in love! The alphabet is stitched around the birds, with pink & red hearts & arrows accented throughout. To complete this design, a small gold heart is included, to be placed in the top border with the stitched hearts. This design will make your heart flutter! Stitch count is 60w x 60h.